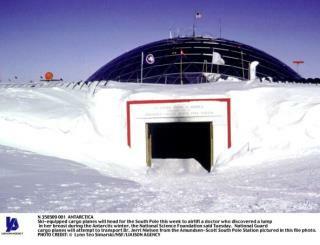 (Newser) – A compelling story out of the US South Pole station: Manager Renee-Nicole Douceur says she has suffered a stroke and needs to be evacuated for proper treatment, but the National Science Foundation says it won't be safe enough to send in a plane for at least a few more weeks. The 58-year-old Douceur and her family are now making a public push to pressure the NSF and the company that manages the base, Raytheon Polar Services, to move. The push includes a website and a Facebook page, and Douceur has given interviews to Discovery and the New York Times among other media outlets. Douceur: "I'm just hanging in there and I'm looking out my window and it's nice and clear bright and sunny. I'm saying to myself why isn't there a plane here to get me out of here today or even yesterday?" Rule #1 in any rescue training class: Don't get yourself killed trying to save someone. Airplanes have to fly in the real world. They are not magic.